Cozy + smell of pancakes – alarm clock = weekend. Chicken Big: Chicken Big towers over the coop and everything else in the barn yard. But if it’s something THAT big, could it really be a chicken? The other chickens in the barnyard aren’t so sure. But size does have its advantages, as Chicken Big is able to prove. 39 Apartments of Ludwig Van Beethoven: I’ve seen/heard of this book for quite a while, but one of the kids grabbed it off the shelf on a recent library trip. It was funny enough to the boys that they requested multiple readings of this book about how much work it might have been for Beethoven to move his five pianos to various apartments in his lifetime. What to Expect When You Are Expecting Joeys: We read several non-fiction picture book titles about Australian animals recently, but this one was my favorite. Written as though it were a guidebook for a marsupial parent-to-be, it packs in a lot of information about not just well-known marsupials like the kangaroo and koala, but many lesser-known marsupials as well. I just discovered there is another about expecting larvae in the same series. I’ll think the boys would enjoy that one too! Al Pha’s Bet: Al makes a bet with himself…that maybe he can find a great way to put 26 letters order. I bet you can guess what Al’s last name is? 😉 This was a silly but fun alphabet book to share with Mr. K.
Do Not Build a Frankenstein: A boy has some advice — building your very own Frankenstein may sound like a good idea…but take his word for it. It’s not! Very funny! Take Your Mama to Work Today: Violet visits her mother’s office and has one viewpoint on all the ways that she is helpful to her mama. But pay attention to the illustrations for another view on things. 😉 Miss M and I enjoyed this one together (I like that she still humors me and lets me read her a picture book every now and then!). Before Tony’s bike accident (read more about that here and here if you are just joining us), we had plans to travel to the Chicago area to celebrate with his side of the family. However, an 8+ hour trip in the car, while possible, just didn’t seem very practical or necessary at this stage of his recovery process. My family lives in our area, but didn’t have any Thanksgiving plans. Figuring this wasn’t the year either to invite friends or family over for a big shindig, we just celebrated as the six of us! I think this is the first time in our ten years of marriage and maybe only the second or third time in my whole life that Thanksgiving didn’t involve some kind of big gathering of family and/or friends. 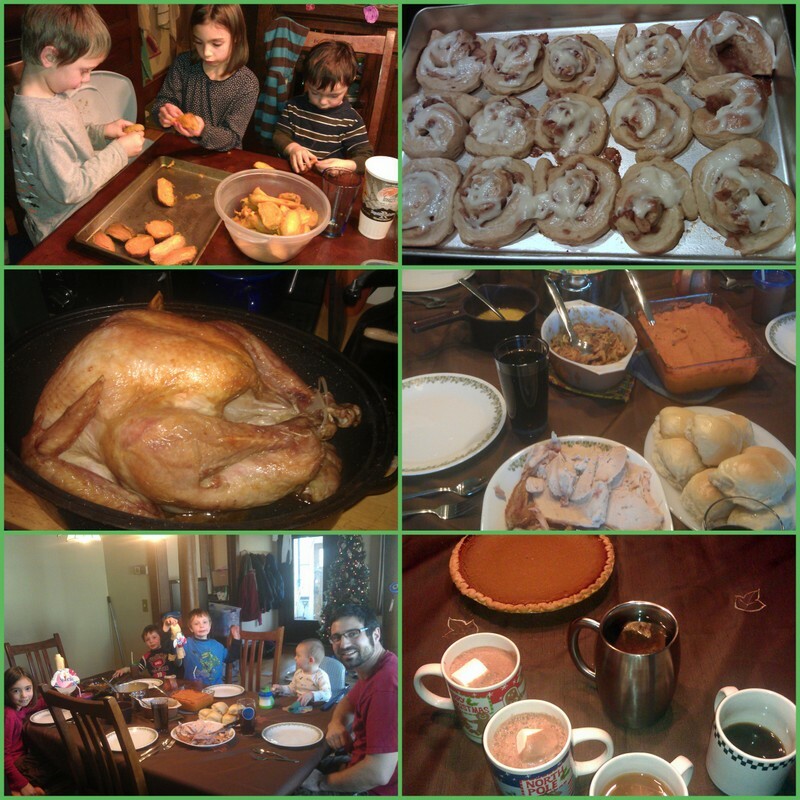 While I was feeling kinda bummed about our lack of big plans for Thanksgiving in the days leading up to the holiday, when the day actually arrived, I really enjoyed the laid back day! We have so much to be thankful for! 1. After spending the week following surgery with his leg in splints/gauze/ace wrap, DH was given a big “boot” at his clinic appointment on Wednesday. He’s still not supposed to put any weight on it, and he should still spend the majority of time with it elevated, but the boot provides a bit more protection for his leg and makes it seem a little more reasonable for him to sit on the floor with the kids or leave it not-propped-up and under the table at dinner and not worry as much about it getting bumped! 2. We had beautiful weather this week (up until the temp started dropping like a rock yesterday afternoon!) — weather in the 50s and 60s in November is MN is heavenly! After 60 degree weather yesterday morning, now as of last night we have snow on the ground! Fun Minnesota weather! (And yes, I was closely watching J with the sticks! He thought they were pretty fun to scoot along with). 3-5. We did light school days on Monday and Tuesday, with our “Thanksgiving Break” starting on Wednesday. For spelling this week we played games. On Monday we reviewed spelling words outside while running, hopping, jumping, and so on. Then on Tuesday we played the Logic of English games of Phonogram Bingo and Phonogram Tic-Tac-Toe. 6. For math this week, I worked on two RightStart B lessons with Mr. E on telling time, and worked with Miss M on subtracting time and adding/subtracting measurements with feet and inches. 7-8. 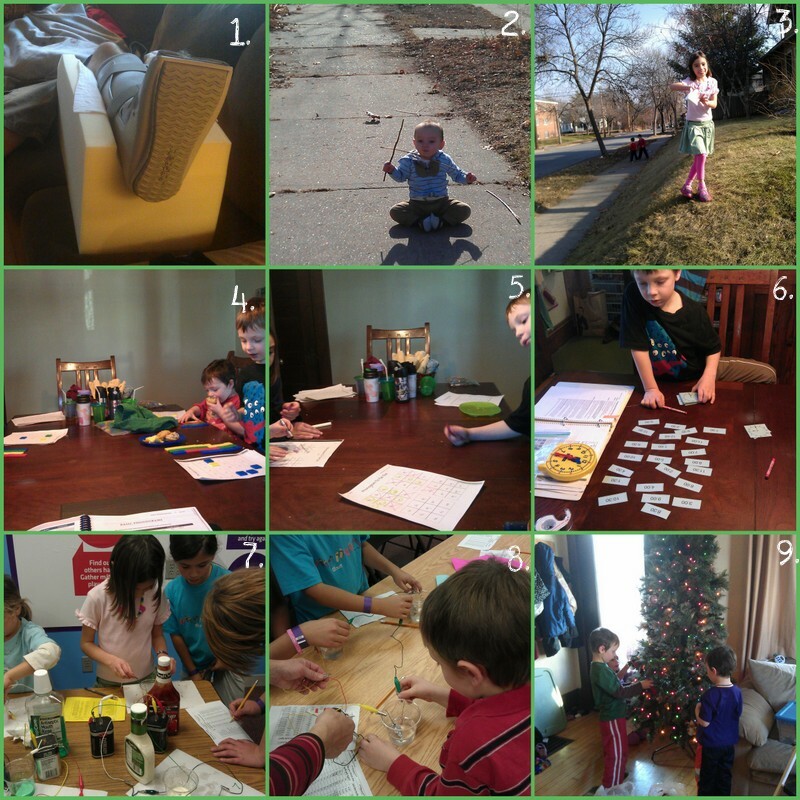 On Monday afternoon we headed to the monthly “homeschool day” at The Works, a science and engineering museum we recently got a membership for. The kids did an hour-long workshop about electrolytes that involved testing various substances to see if they could conduct electricity. Then they made a wet-cell battery! I made a super quick trip to Target last night while everyone was asleep to get a couple items, but the rest of our weekend plans are for fun and relaxing at home as a family. Well, maybe I’ll do a little online shopping! 🙂 I hope you have a wonderful weekend, whether you are shopping or relaxing or doing more celebrating! First, an update on my DH, Tony (read about his bike accident in last week’s collage post if you missed that). Tony had a doctor visit with a specialized surgeon on Tuesday, who then performed the second surgery Tony needed on his leg on Wednesday to repair the larger of the two broken bones and to do final reconstruction of the ankle joint (the bones were broken just above the ankle). This was even outpatient surgery! Tony and I spent the whole day at a surgery center while the kids hung out with Grandma (my mom). We’re thankful that after this second surgery there are no pins sticking out from his leg — just a couple of strong splints tightly wrapped up to hold things in place. Yesterday was a rough recovery day for him with lots of pain, but by this morning it looked like things were improving. We’re still looking at about 2 weeks of DH having his leg elevated, plus several more weeks of no weight-bearing on the affected leg. Luckily, since it is his left leg, he can start driving back into work as soon as he is off the stronger pain medication (and he can work from home in the mean time as soon as he is feeling up for it!). My plan had been to only take Wednesday off from school, but Tuesday ended up being almost a wash as well — Miss M completed her independent work, but between Tony’s appointment, a trip to the DMV for a temporary handicap parking permit, gymnastics class and a trip to Target for prescriptions, we ran out of time for anything else! 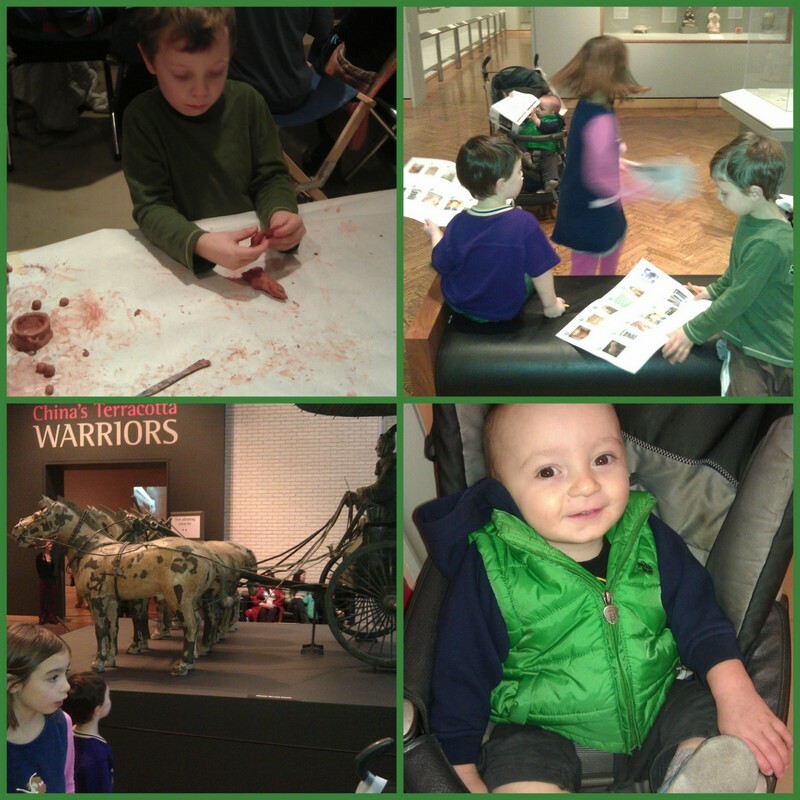 Prior to the start of the new school week, on Sunday afternoon, the kids and I headed to the Minneapolis Institute of Art for their monthly Family Day. This month’s theme was “China” due to the opening of a traveling exhibit featuring some of the Terracotta Warriors from the First Emperor’s tomb. This exhibit typically has a hefty ticket fee, but it was free for family day! Yay! They didn’t allow photography in the actual exhibit (just of this replica chariot outside the exhibit), but WOW! It was cool to see six warriors and two horses in real life (we’ve read about them in several books in past years). Plus there were many other smaller artifacts to see. I’m hoping we can go back for a tour with our co-op to hear a tour guide give more information about the exhibit. The kids also enjoyed sculpting their own terracotta warriors, making animal hats (I missed getting a picture of this) and going on a “gallery hunt” to find pieces of Chinese artwork in various museum galleries. Baby J is so happy to sit in his stroller and take it all in. I’m happy to have a 4th child who is content to do this! We got out the math balance for Mr E (Kindergarten) on Monday, and whizzed through the three lessons that use the balance in RightStart B. Both Mr. E and Mr. K had fun playing with the balance. We completed two additional lessons as well, for a total of 5 math lessons (not bad considering he really only did school work on three days!). Mr. E decided he wanted to read a “harder book” this week, so over the course of the week he read about half of Danny and the Dinosaur with me. We did a bit of spelling review, and that was all for formal Kindergarten work this week! I worked with Miss M on three lessons in RightStart D this week on numerical patterns and adding and subtracting time. She did some additional work on her own from some of the earlier lessons (review material she can complete without a new lesson from me). In spelling, Miss M took the test on lesson 16 and wrote a long story using this lesson’s spelling words. Unfortunately, she only got about half of the words correct on the test for this lesson, and I’m not sure where the breakdown in her understanding is happening. Miss M also did her usual science reading/notebooking with Sassafras Science, and read some assorted history books. We had our first real snow of the year on Monday. It mostly melted by the end of the day Tuesday, but that didn’t stop the kids from donning their snow gear and playing on Monday. With Tony less able to help around the house, it’s the perfect opportunity to give the kids more responsibility. I taught Miss M how to make pancakes and french toast, and she was able to make the pancakes with almost no assistance from me — I just needed to get out the griddle and turn it on! In contrast to last week, we did tons of reading this week. We finished a couple of history read-alouds, worked on “Liberty or Death” by the Maestros, and started a new family read aloud read by daddy — James and the Giant Peach. We decided that reading time was a good way to spend the evening when daddy needs to stay lying down! Grandma also read many, many extra stories to the kids while she was babysitting. Lucky boys get three stories each at bedtime when Grandma is doing the reading!!! As we continue working our way through our stack of books on the Revolutionary War, we’ve finished two more chapter books from that time period — Sophia’s War by Avi and Ben and Me by Robert Lawson. I read Sophia’s War as a bedtime read-aloud to Miss M. It’s definitely more of a middle-grade read — even last year I think Miss M (currently age 8) would have been too young for it. Twelve-year-old Sophia Calderwood lives with her parents in British-occupied New York City in 1776. She and her family are patriots, though they keep this fact well-hidden in order to secure their safety. Her older brother had earlier joined the Continental army, and initially Sophia and her parents do not know his fate. Unfortunately, Sophia learns that her brother has been captured and thrown in a British jail. Conditions in the British jails are horrendous, and, despite Sophia’s best efforts to prevent it, her brother dies in captivity. Soon after this event in the story, the narrative jumps ahead to 1780. Now 15, Sophia is providing for her family by working in a print shop. She meets a mysterious gentleman who gives her an unusual opportunity — Sophia becomes a housemaid in the British military headquarters in New York, with the intention of reporting information to the Americans. She uncovers a plot so unbelievable (involving Benedict Arnold), she will have to go to extreme lengths to stop the treason. It’s obvious that this book is very well researched — I love how Avi wove Sophia’s story into the true story of Benedict Arnold’s attempt to give West Point to the British. This is definitely not a story for a very sensitive child — Avi doesn’t hesitate to describe things like a hanging and the awful conditions in which the British held American prisoners. Overall, I’m very glad I added this one to my list of read-alouds for the Revolutionary War! In contrast to Sophia’s War, Ben and Me by Robert Lawson is one of those historical fiction books that barely qualifies for the label “historical”. I read this to all the kids, mostly as an “afternoon snack time” read-aloud. 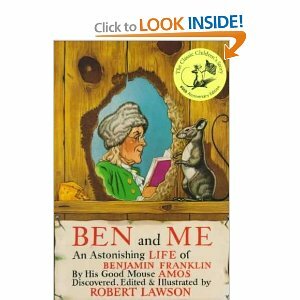 Ben and Me is written from the perspective of a pet mouse, Amos, who is supposed to have lived in Ben Franklin’s hat. Throughout the story we get the “real” perspective on events in Ben’s life. It was Amos who provides the ideas to invent the Franklin stove, who assists with electricity and lightning experiments and who runs from dignitary to dignitary to listen in and tell Ben what is really going on. This was a light, funny read-aloud that the boys could easily follow along with. I’m not sure there was as much “educational value” here as many of the history-related fiction books we’ve read, but it was fun nonetheless. 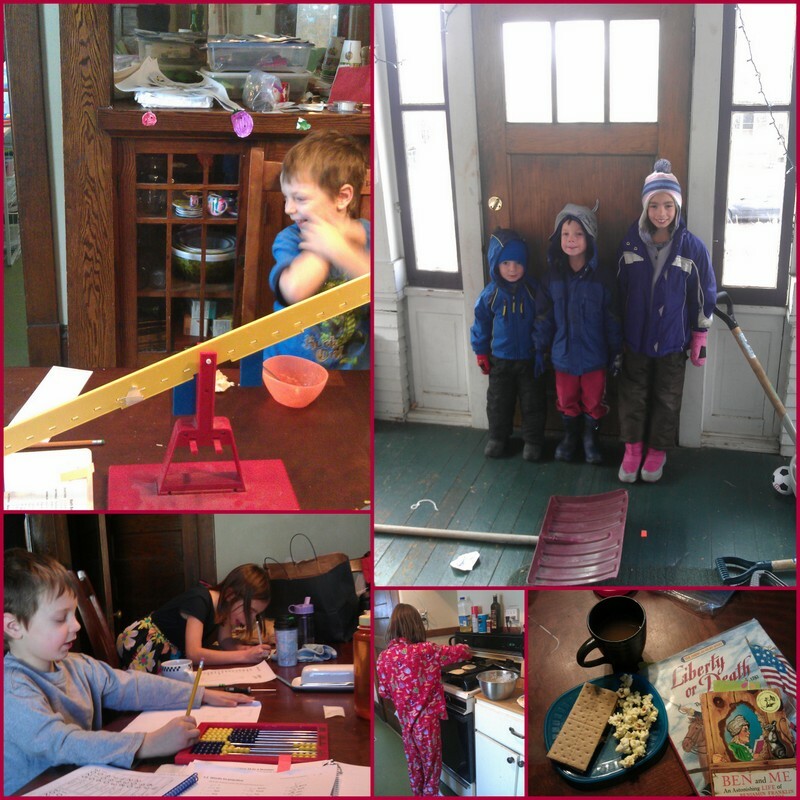 This week started out like any other…and quickly changed in a way that will define our next two or three months. Tony called shortly after he left for work to let me know he had taken a nasty fall on his bike and needed me to pick him up. I quickly shuffled the kids across the street to the neighbor’s house, and left to pick him and his bike up. It wasn’t but a few minutes later that he called and said I would just be picking up his bike — he couldn’t put any weight on his leg and thought we should call an ambulance. I took the bike home, and he went to the hospital. After Tony spent many hours in the ER, the verdict was both bones broken (quite badly) in his lower left leg. 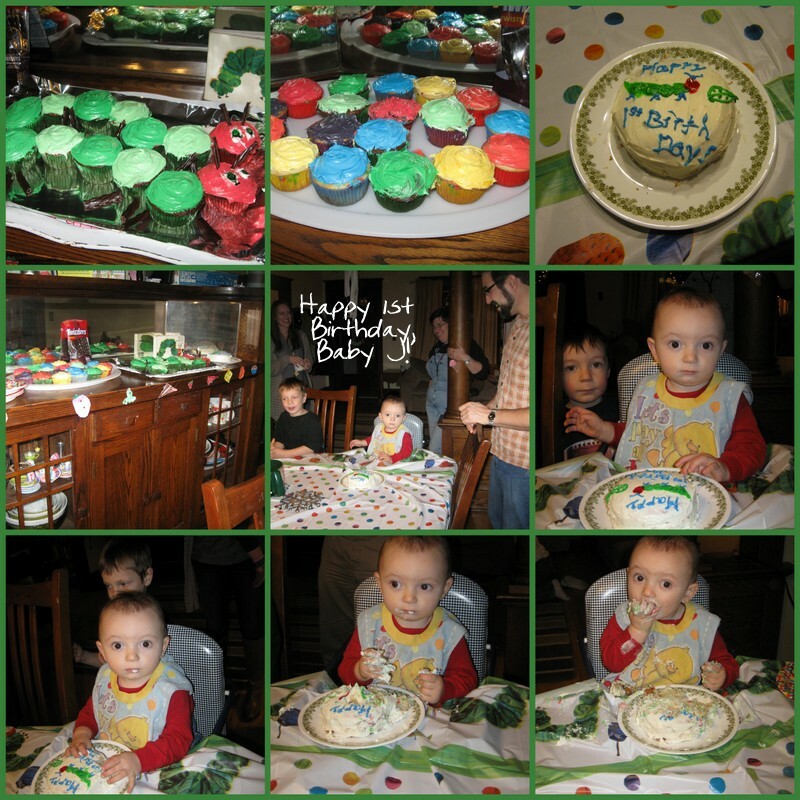 He had one surgery Monday night, and then was able to come home Wednesday night. He’ll have a second surgery next week. Needless to say Tony is taking it easy and spending nearly all his time with his leg elevated at the moment (and there are lots of pins sticking out from his leg right now, making it tough to do much of anything! 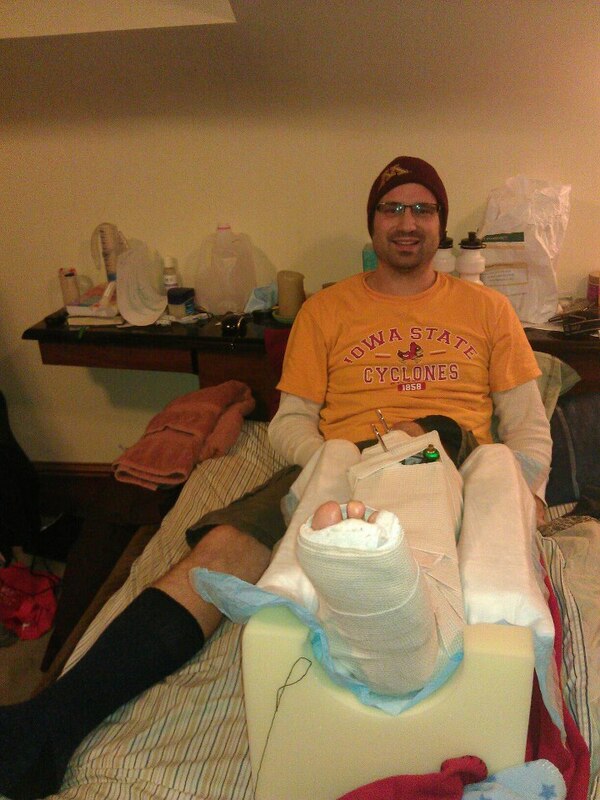 ), and he’ll have to keep weight off of it for up to 12 weeks. So, the kids and I have a new focus over the next several weeks — helping out Daddy, getting him what he needs to be comfortable, and picking up the slack around the house to make sure everything still gets taken care of! We really have a lot to be thankful for given the circumstances — the accident could have been so much worse, it happened pretty close to home, we have tons of family and friends offering to help us out, and Tony is able to do much of his work from home (his employer is being very helpful in getting things set up for him to work remotely as long as is necessary). I’m finding a lot of little things to be thankful for too — I had just done a lot of “stock up” grocery and Target shopping so I have most of what I need at home, we had most of our fall “outside chores” taken care of, we recently got a larger dishwasher and our first snowblower, and it didn’t happen in the summer when we would have been expecting to spend a lot of time doing outside activities as a family. 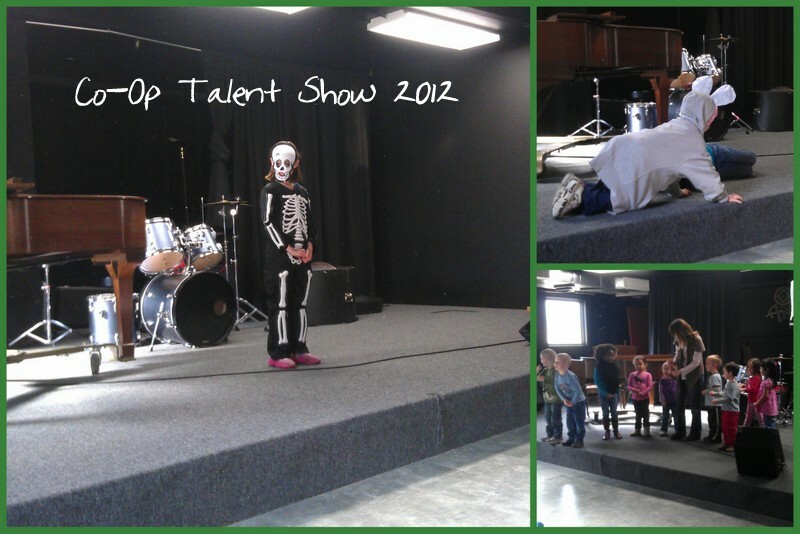 Miss M sang and danced to “Dem Bones” (an act planned before the events of this week! ), Mr. E played a mouse in a skit of Aesop’s fable “The Lion and the Mouse,” and Mr. K sang a fall song with his preschool class. Family Science Saturday: Last Saturday, before Tony’s accident, the kids spent the morning with daddy playing with dry ice! They haven’t gotten to do any science activities with daddy in a long time and they have been begging for weeks to use dry ice, so that was a perfect way for them to spend the morning while I was doing my grocery shopping. My rock and mineral samples arrived yesterday from Home Science Tools, so I am excited for us to start a new family science study on rocks and minerals next week! Miss M’s learning highlights this week (3rd grade): Miss M read about Australian animals in Sassafras Science Adventures, including reading several library books about marsupials. She was so excited for me to take a picture of her reading, don’t you think. 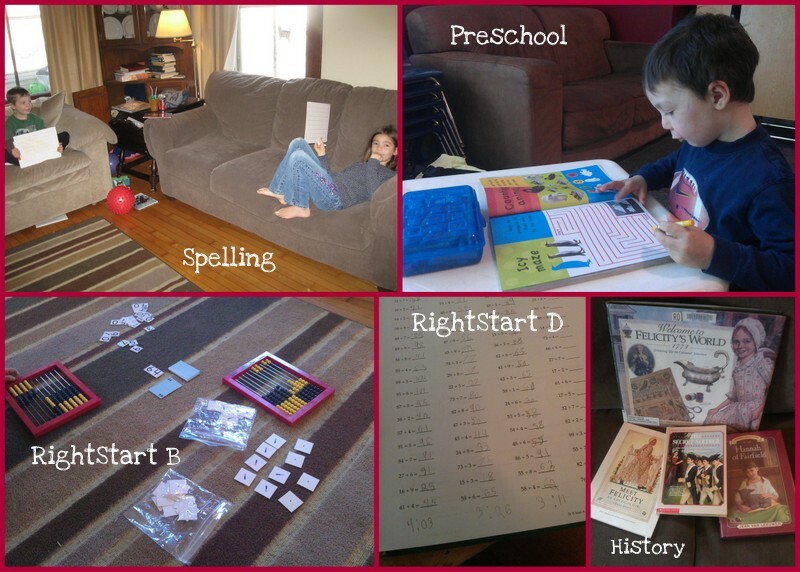 😉 We also did lessons 25,28, and 29 in Right Start Math D (plus some earlier worksheets for independent work — we’re skipping around to just cover lessons that are new to Miss M), and we started lesson 16 in Logic of English Essentials. For History this week, Miss M read a few Jean Fritz books about key figures in the American Revolution this week, as well as a biography of George Washington by the D’Aulaire’s . 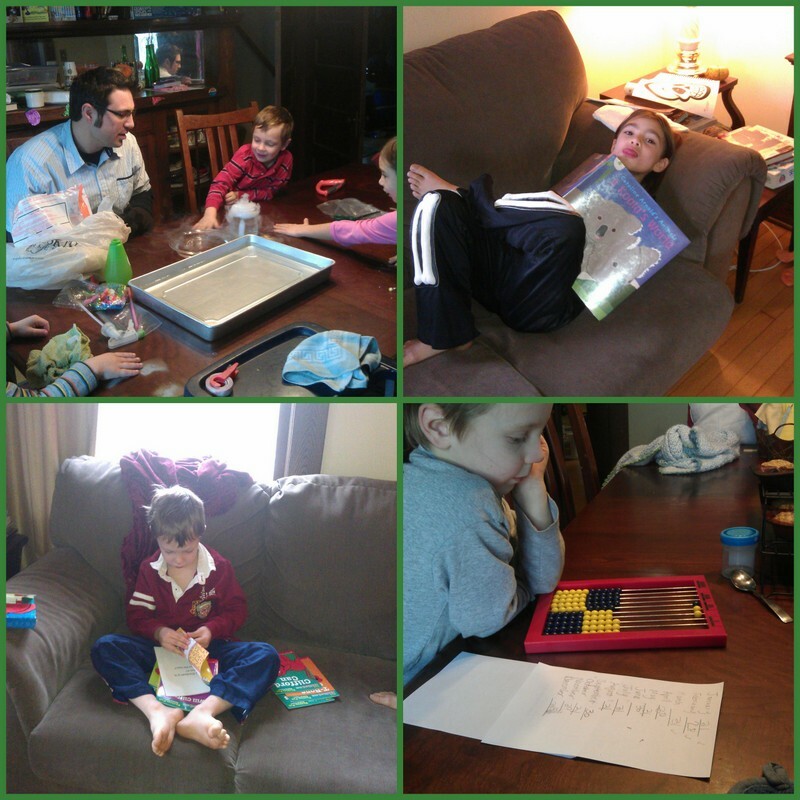 Mr. E’s learning highlights this week (Kindergarten): Mr. E and I kept things pretty simple — He read to me every day, we reviewed his LOE-E phonograms that he has learned so far, and we did some RightStart B math, finishing lesson 45 as well as doing lessons 46 and 47. In the lower right picture above, he is calculating the number of days in a year. We get to use the math balance for his RS-B lessons next week. We’re looking forward to that! Probably what suffered most in our distracted school week was read-alouds. I still fit in my bedtime read-aloud with Miss M most nights (We are loving Sophia’s War by Avi), but we were at a standstill with our other history read-alouds all together, and in general I didn’t do nearly as much reading to the boys as usual. 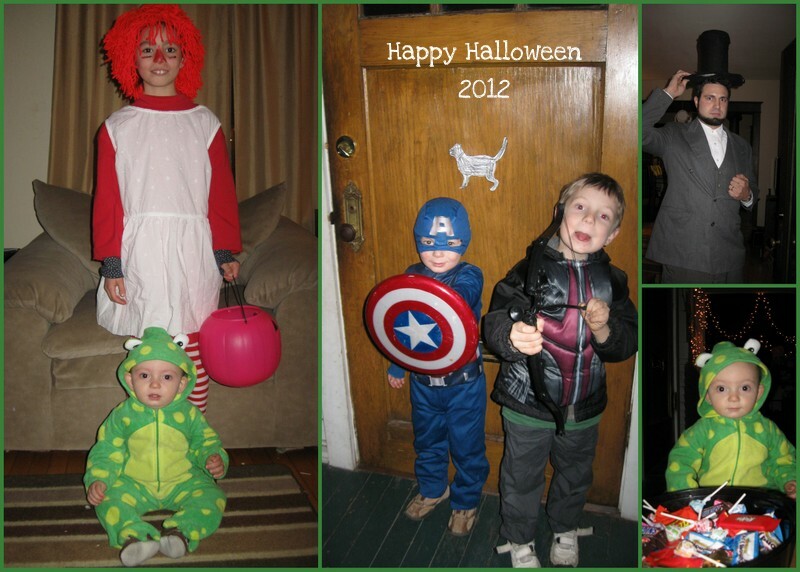 I’m Linking Up With: Collage Friday and The Weekly Wrap-Up! In our US History studies this year we’ve hit the Revolutionary War period, and we’ve already completed a few read-alouds related to this theme. I hadn’t necessarily intended for all my bedtime read-alouds with Miss M to be focused around our history themes, but so far that has been the case. After finishing The Witch of Blackbird Pond, I thought we would go for non-history read aloud. We read one chapter of The Wind in the Willows, and neither of us really liked it. I know it’s a classic, but I wasn’t impressed after that short trial. I checked out a “Classic Starts” abridged version, and I may assign that to Miss M at some point in the near future. I needed a new read-aloud more quickly than I expected, but I didn’t have some of the other history-related titles for Miss M handy (and she requested another history read-aloud). So, I looked at All Through the Ages to see if I could find something that I could acquire as a free ebook. A Little Maid of Old Philadelphia by Alice Turner Curtiss seemed to fit the bill, so I downloaded it from Amazon. A Little Maid of Old Philadelphia takes place in British-occupied Philadelphia in 1778. Ten year old Ruth Pennell is the “little maid” of this book (there are several other “Little Maid” titles by the same author featuring different girls in different cities). As the story opens, Ruth’s aunt is staying with her while her mother is away caring for an ill relative and her Father is with General Washington’s army — and Ruth’s dog is missing. Ruth takes matters into her own hands to find the dog (and meets an important figure in the British army in the process!). She has a series of other adventures along with a few of her friends that culminate in her very own opportunity to help the Patriots in the war effort. Miss M and I generally both like these kind of “episodic” stories about young girls and their adventures, and this was no exception. I think I can see, though, why this one maybe didn’t survive the test of time to become a well-known classic. Compared to more modern works (or even more “classic” older books), the tone of A Little Maid of Old Philadelphia was a bit moralistic at times. Ruth got herself into a bit of trouble with some of her adventures, and the author was not particularly subtle about what lesson Ruth (and the readers of the story) was supposed to learn about asking permission to do things, borrowing things that belong to others or letting a grown-up know where you are going! These obvious moral lessons didn’t seem to bother Miss M at all — she was very eager to read other titles in this series (at least four of which were available free in Kindle format at amazon.com — I haven’t looked around to see if any of the other titles in the series are available as free ebooks). After A Little Maid of Old Philadelphia, we moved on to Toliver’s Secret by Esther Wood Brady. Ellen Toliver is another 10 year old girl, this time living in New York City (also occupied by the British). Though I didn’t catch a date in this story, from the events described I would guess it perhaps takes place in 1777. Ellen is shocked to learn that her Grandfather is a spy for the patriots. When Grandfather is injured and can’t take a secret message across the river, he asks Ellen to take his place. It was supposed to be a simple mission of riding across the river with the merchants and finding Grandfather’s friend at a tavern. Nothing goes according to plan, however, and typically-timid Ellen is faced with a very difficult and dangerous journey. This was a quick and exciting read for Miss M and I. She could have easily read it on her own (and did read a couple chapters out-loud one night while I put away my laundry! ), I enjoyed sharing it together with her. After finishing this book we started another Revolutionary spy tale – Sophia’s War by Avi. This is a bit more mature and complex story. We’re only a few chapters into it, and I’m eager to find out how this book will develop. Finally, I have a picture book read aloud to share: Those Rebels, John & Tom, by Barbara Kerley, Illustrated by Edwin Fotheringham. Thanks to Amy @ Hope is the Word for the recommendation of this title! We have quite a few picture books from this era in our book basket, but Miss M has been reading most of them independently, and the boys haven’t been picking them on their own. Finally this week I asked Mr. E to pick a book from the history book basket as a part of his school time, and Mr K and Miss M decided to listen as well. Those Rebels, John and Tom is a biography of two famously different friends — Thomas Jefferson and John Adams who put aside their differences for the good of a new nation. I loved Kerley’s writing style — it’s pretty lighthearted for a serious topic, which makes it all the more fun for everyone listening to the book. The illustrations are a bit in the style of political cartoons, and the kids enjoyed looking for some of the details in the pictures. We’re knee deep in Revolutionary War books around here, so I’m sure I’ll have more to share in future weeks!